Sandie Colbert from Kansas City prayed during pro-life lobby day March 12 in Jefferson City. More than 300 people attended the lobby day. 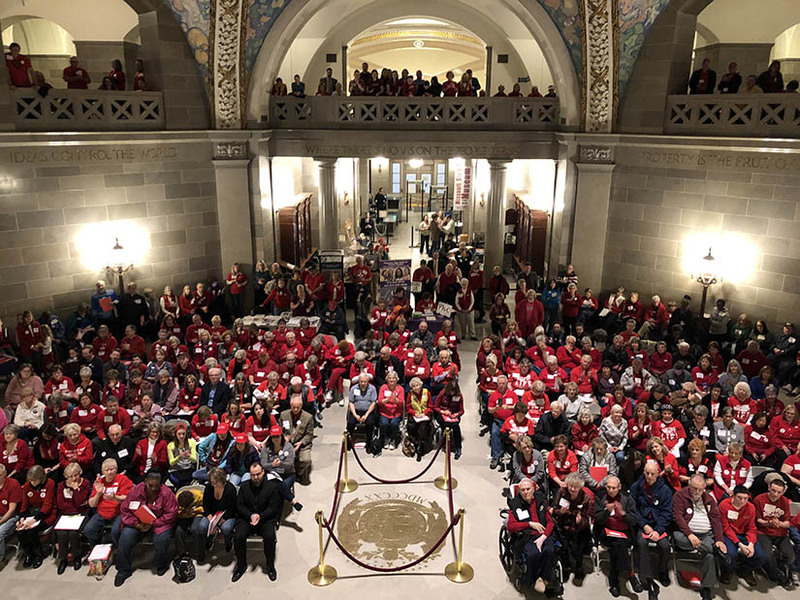 With a push for the legislature to pass the Missouri Stands for the Unborn Act, pro-lifers were fired up at a recent lobby day at the Missouri Capitol. More than 300 people attended a rally in the Capitol rotunda March 12. Beforehand, they visited with legislators to ask for their support of pro-life legislation. The annual lobby day is hosted by Missouri Right to Life. Gov. Mike Parson, who received a standing ovation from the crowd, referred to them as “soldiers” who are fighting a battle for the unborn. Sponsored by Rep. Nick Schroer, R-O’Fallon, HB 126, called the Missouri Stands for the Unborn Act, includes a ban on abortion after the detection of a fetal heartbeat; a ban on abortions at 20 weeks gestation, when an unborn child can begin to feel pain; enacts the “Right to Life of the Unborn Child Act,” which would ban all abortions in Missouri if Roe vs. Wade is overturned, a federal Human Life Amendment is adopted or a federal Human Life bill is enacted; bans abortions for reasons including Down syndrome, race or gender; requires a second custodial parent to be notified when a minor is seeking an abortion, with certain exceptions. It also would increase medical malpractice insurance requirements for those who perform or induce abortions and adds additional insurance requirements for doctors who induce abortions using chemicals or drugs; and recognizes that “God is the author of life” and states that Missouri is a “sanctuary of life” that protects pregnant women and unborn children. Other statewide officials who spoke included Lt. Gov. Mike Kehoe, Secretary of State Jay Ashcroft, Attorney General Eric Schmitt, and Treasurer Scott Fitzpatrick. Legislators including Schroer and Sen. Bob Onder also spoke of their support for pro-life legislation. Bishop Shawn McKnight of Jefferson City opened the rally with prayer. Sue Thayer shared her story as a former manager at a Planned Parenthood clinic in Iowa. She objected when the clinic began offering “webcam abortions,” a chemical-induced abortion led by a doctor at a remote location who speaks to a patient via video chat. It was then that she felt the clinic was not focused on providing women’s health care, but increasing profits. She said that God began to reveal to her that abortion is wrong. In 2012, she led a 40 Days for Life campaign outside of the clinic in Storm Lake. By the end of the campaign in March, the clinic announced it was closing. She is now director of outreach for 40 Days for Life and founded a pregnancy resource center. “Science shows us the miracle of life in the womb …yet we have so many people who deny the humanity of an unborn baby,” she said. Thayer called the Missouri Stands for the Unborn Act “a bill that most pro-life people across the country only dream about.” Planned Parenthood, she said, doesn’t like any kind of regulations, such as clinic inspections, hospital privileges laws for doctors, or waiting periods before an abortion. Vince and Marianne Burkemper of St. Joseph Parish in Manchester have attended the annual lobby day for many years, visiting with legislators to ask for their support of pro-life bills. Vince Burkemper, who coordinates St. Joseph’s participation with 40 Days for Life, said this year has been the parish’s largest response to the campaign — which includes standing outside Planned Parenthood in prayer — in recent years. Sam and Stephanie Marsh of New Cambria, Mo., brought their four children to the lobby day. The family is a member of the Kirksville chapter of Missouri Right to Life. This was their third year attending. “I like to come to fight for babies who can’t fight for themselves and to save lives,” said nine-year-old Samantha Marsh. Contact your senators in support of HB 126, the Missouri Stands for the Unborn Act. To look up your senator’s contact information, visit www.senate.mo.gov.